Although it was CERAWeek by IHS Markit, it often sounded more like climate week. Senate Energy and Natural Resources Chairwoman Lisa Murkowski (R-Alaska) and ranking member Joe Manchin (D-W.Va.) appeared onstage together Monday to call for bipartisan solutions to lower emissions. Two days later, Energy Secretary Rick Perry signaled a willingness to engage with supporters of the Green New Deal. Perhaps most significant was talk of climate-related action by oil and gas executives. BP PLC and Royal Dutch Shell PLC endorsed federal regulation of methane emissions from energy production. Power companies also were here discussing potential growth for renewables and batteries, while Ford Motor Co. mentioned its work to electrify the F-150 pickup truck (Energywire, March 13). And Fatih Birol, executive director of the International Energy Agency, told reporters the oil industry must do more to reduce its carbon footprint. There wasn't widespread endorsement of the sprawling Green New Deal climate framework being debated in Congress or a move away from all fossil fuels. But there was a current pushing companies and policymakers in the world of oil, natural gas and power generation to consider ways to address carbon dioxide emissions and a changing climate, from carbon capture to electric vehicles. Some of that was driven by U.S. lawmakers weighing legislative options and companies increasingly aware of shareholders and regulators pushing on the climate issue. 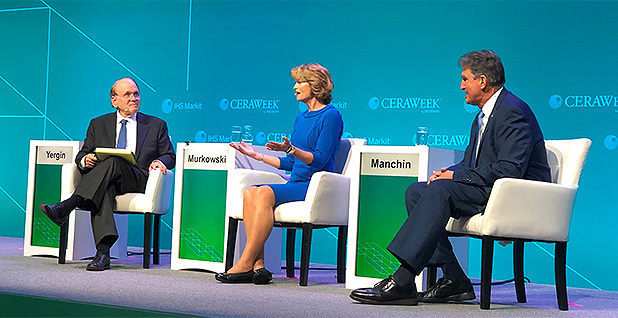 "While at #CERAWeek, a topic that frequently came up in conversation is addressing climate change w/ future energy policy," Murkowski tweeted Friday. "Climate change is real & we must take reasonable & practicable action to address it. The best way to address it is through major technological breakthroughs." Last week marked the 38th edition of CERAWeek, whose name is derived from the former Cambridge Energy Research Associates. Daniel Yergin, vice chairman of IHS Markit, served as the main conference host. The event had record attendance this year with more than 5,300 attendees, including over 800 speakers. That doesn't count the more than 280 registered media members for the conference, which calls itself "The World's Premier Energy Event." CERAWeek has long been associated with big names in oil and gas, from industry CEOs to global dignitaries. While green themes have come up before, this year's conference included an unprecedented focus on climate issues that could change the way energy companies do business. A Monday panel was called "Climate Strategies in a World of Rivalry." And the conference website used a climate lens to describe a Thursday session on electrifying transportation. "Shifting transportation from oil to electricity is critical for curbing climate change," a CERAWeek website blurb said. "What scope and scale are needed to meet climate objectives?" On Friday, as the conference was wrapping up, Yergin told E&E News he didn't see CERAWeek as "climate week." But he agreed that climate was a theme that ran through the entire event. "It reflects the times and what people are thinking about," Yergin said. "And you see a change from one year to [the] next, and that change was very evident." Fred Krupp, president of the Environmental Defense Fund, noted changing positions by BP and Shell on methane emissions. EDF also said in a blog post last week that it and Exxon Mobil Corp. were working to reduce methane emissions. "We're definitely hearing more constructive words," Krupp told E&E News last week. "Will we see more constructive action?" Joseph Goffman, executive director of the Harvard Law School Environmental & Energy Law Program, said on Twitter last week that pro-methane regulation statements from BP and Shell were "performance art for shareholders and antsy investors." Goffman said BP CEO Bob Dudley stated support for methane regulation while he can count on the Trump administration's EPA "to do nothing." The Green New Deal was criticized and questioned during the conference even as it saw some recognition for stirring conversation. Some speakers wanted more details of the plan, while others lamented the potential for a heavy-handed government approach. EPA Administrator Andrew Wheeler said the idea of dismantling U.S. fossil fuel production would be not only "dangerous for the economy and national security" but also "devastating for public health, both here and abroad" (E&E News PM, March 11). Ernest Moniz, a former Energy secretary under President Obama, called for pragmatism. Sen. John Cornyn (R-Texas) said the Green New Deal is, in some ways, a proposed solution in search of a problem. He said Senate Majority Leader Mitch McConnell (R-Ky.) planned a vote to see how serious proponents are about it. Cornyn sided with the idea of using technology to tackle climate issues. "To me, innovation and experimentation are the sorts of things that have allowed us to discover great things that have benefited humankind," Cornyn told reporters Friday. Mike Sommers, CEO of the American Petroleum Institute, defended the oil and gas industry's environmental record and described its work to help the human condition. He said the sector continually has to provide solutions for future energy needs and climate issues. "Our position on this is that we'll evaluate any climate change proposal or any carbon tax proposal that comes before the Congress," Sommers said last week. "At this time, there's no real proposal before the Congress." Bjørn Otto Sverdrup, senior vice president for sustainability at Equinor ASA, said the industry has "tremendous potential" to clean up its own houses and give it time to work on alternatives to fossil fuels. Last year, the Norwegian company changed its name from Statoil ASA to help emphasize a broader energy focus. In the electricity sector, Michigan-based CMS Energy Corp. was among the companies at CERAWeek discussing plans to slash carbon emissions. Perry, the U.S. Energy secretary, highlighted the emissions benefits of nuclear power generation, which he also views as important for a reliable and resilient grid. "I don't know how anybody who cares about the climate can't be for nuclear energy," Perry told reporters Wednesday. On Thursday, CEO Curt Morgan of Vistra Energy Corp. said he thinks renewables will become a bigger part of the generation base, noting the attractiveness of solar and other sources. Vistra gained attention in 2017 when it announced plans to take a number of coal-fueled generating units off the main Texas grid in 2018. Morgan said coal plants will continue to retire as they age. "I do believe that coal is on its way out — not because I don't like coal," he said, adding, "I love coal power plants, but the economics just don't work."